Objective To compare the hazards of cigarette smoking in men who formed their habits at different periods, and the extent of the reduction in risk when cigarette smoking is stopped at different ages. Design Prospective study that has continued from 1951 to 2001. Results The excess mortality associated with smoking chiefly involved vascular, neoplastic, and respiratory diseases that can be caused by smoking. Men born in 1900-1930 who smoked only cigarettes and continued smoking died on average about 10 years younger than lifelong non-smokers. Cessation at age 60, 50, 40, or 30 years gained, respectively, about 3, 6, 9, or 10 years of life expectancy. The excess mortality associated with cigarette smoking was less for men born in the 19th century and was greatest for men born in the 1920s. The cigarette smoker versus non-smoker probabilities of dying in middle age (35-69) were 42% ν24% (a twofold death rate ratio) for those born in 1900-1909, but were 43% ν 15% (a threefold death rate ratio) for those born in the 1920s. At older ages, the cigarette smoker versus non-smoker probabilities of surviving from age 70 to 90 were 10% ν 12% at the death rates of the 1950s (that is, among men born around the 1870s) but were 7% ν 33% (again a threefold death rate ratio) at the death rates of the 1990s (that is, among men born around the 1910s). Conclusion A substantial progressive decrease in the mortality rates among non-smokers over the past half century (due to prevention and improved treatment of disease) has been wholly outweighed, among cigarette smokers, by a progressive increase in the smoker ν non-smoker death rate ratio due to earlier and more intensive use of cigarettes. Among the men born around 1920, prolonged cigarette smoking from early adult life tripled age specific mortality rates, but cessation at age 50 halved the hazard, and cessation at age 30 avoided almost all of it. This discovery stimulated much further research into the effects of smoking (not only on lung cancer but also on many other diseases), including a UK prospective study of smoking and death among British doctors that began in 1951 and has now continued for 50 years.11–17 The decision that this study would be conducted among doctors was taken partly because it was thought that doctors might take the trouble to describe their own smoking habits accurately, but principally because their subsequent mortality would be relatively easy to follow, as they had to keep their names on the medical register if they were to continue to practise. Moreover, as most doctors would themselves have access to good medical care, the medical causes of any deaths among them should be reasonably accurately certified. The 1951 study has now continued for much longer than originally anticipated, as the doctors did indeed prove easy to follow, and they provided further information about any changes in their smoking habits along the way (in 1957, 1966, 1971, 1978, and 1991). A final questionnaire was sent out in 2001. By 1954 the early findings11 had confirmed prospectively the excess of lung cancer among smokers that had been seen in the retrospective studies.2–10 Findings on cause specific mortality in relation to smoking were published after four periods of follow up (after four years,12 10 years,13 20 years,14 15 and 40 years17). The early results from this study,12–14 together with those from several others that began soon after, showed that smoking was associated with mortality from many different diseases. Indeed, although smoking was a cause of the large majority of all UK lung cancer deaths, lung cancer accounted for less than half of the excess mortality among smokers. As recently as the 1980s, however, the full eventual effects on overall mortality of smoking substantial numbers of cigarettes throughout adult life were still greatly underestimated, as no population that had done this had yet been followed to the end of its life span. The present report of the 50 year results chiefly emphasises the effects on overall mortality (subdivided by period of birth) of continuing to smoke cigarettes and of ceasing to do so at various ages. With the passage of time and the maturation among UK males of the smoking epidemic—that is, the arrival of a period in which even in old age those who still smoked had, in general, been smoking cigarettes regularly since youth—the 40 year results17 showed that the risks from really persistent cigarette smoking were much larger than had previously been suspected1 and suggested that about half of all persistent cigarette smokers would eventually be killed by their habit. The 50 year results consolidate these findings, following even the participants who were born after 1900 well into old age. Britain was the first country in the world to experience a large increase in male lung cancer from cigarette smoking.18–20 But, even in Britain, those born in the latter part of the 19th century had, at a given age, much lower lung cancer rates than the worst affected generation of men who were born in Britain in the first few decades of the next century. Hence, after presenting the findings for mortality during 1951-2001 in the study as a whole, this report considers separately the findings among those doctors born in the 19th century (1851-1899) and those born in the 20th century (1900-1930, considering separately 1900-1909, 1910-19, and 1920-29). Only among those born in the 20th century—many of whom were young when they started smoking substantial numbers of cigarettes—can we hope to assess the full hazards of continuing to smoke cigarettes throughout adult life, and, correspondingly, the full long term benefits of stopping at various ages. Previous reports of this and other studies13 14 17 21 22 have reviewed the associations of smoking with many specific causes of death and considered the reasons for them, leading to the conclusion that in this study the substantial differences between smokers and non-smokers in overall mortality are due chiefly to the causal effects of smoking. This report therefore uses only 11 major categories of cause of death, some of which are quite broad, and several of its main analyses are of all cause mortality. Information about smoking habits was obtained in 1951, and periodically thereafter, from two thirds of all male British doctors, and their cause specific mortality has been monitored prospectively from 1951 to 2001, supplementing the information available from state records with data from personal inquiries. The 1951 questionnaire was sent to all doctors resident in the United Kingdom whose addresses were known to the BMA. At that time no relevant ethics committees existed. Usable responses were received from two thirds, yielding information on the smoking habits of 34 439 male doctors (10118, 7477, 9459, and 7385 respectively born before 1900, in 1900-1909, in 1910-19, and in 1920-30). Their age specific smoking habits have been reported previously14; only 17% were lifelong non-smokers. Efforts have been made to follow until 2001 all those not known to have died, with the exception of 17 who were struck off the medical register for unprofessional conduct, 467 who requested (mostly in the fifth decade of the study) no further questionnaires, and 2459 who were known to be alive but living abroad on 1 November 1971, when we withdrew them. Among the remaining 31 496 the follow up of mortality is, irrespective of any other migration, 99.2% complete (with only 248 untraced (usually since the 1970s)); 5902 are known to have been alive on 1 November 2001 and 25 346 are known to have died before then. Those withdrawn before the end of the study or untraced are included in the analyses of mortality until the time of withdrawal, or until contact was last made. The original questionnaire in 1951 asked only a few questions about the individual's current smoking habits or, for ex-smokers, about the types and amounts of tobacco last smoked. These were elaborated in further questionnaires in 1957, 1966, 1971, 1978, and 1991, to which the response rates (after reminders) varied between 98% initially and 94% finally. Accounts of the questions asked have been reported previously,11–17 as have the trends in cigarette consumption.14 Only the 1978 questionnaire,16 which was limited to those born in the 20th century, sought information about a wide range of characteristics (height, weight, blood pressure, alcohol, etc, including medical history) and asked those who had stopped smoking whether they had done so because they had already developed some serious respiratory or vascular disease. The 2001 questionnaire sought only to check that we had identified correctly the individuals we believed we had traced. To help assess the effects of persistent cigarette smoking, those categorised as “current cigarette smokers” in reply to a particular questionnaire had to have reported smoking cigarettes, and only cigarettes, in that and any previous reply. This excludes all who had previously replied that they were using any other type of tobacco, or no tobacco. Likewise, those classified as “former cigarette smokers”were either ex-smokers in 1951 whose last habit involved only cigarettes, or current cigarette smokers (defined as above) who had stopped. The terms “never smoker” or “non-smoker” mean lifelong non-smoker—that is, they exclude any respondent who had smoked on most days for a year. Those who, despite reminders, failed (perhaps because of illness) to complete a particular questionnaire could generally be traced for mortality and so continued to be analysed according to their previously reported smoking habits. The main analyses of mortality in relation to smoking seek to determine whether, among men in the same five year age group (16 groups, from 20-24 years to 90-94 years, then > 95 years) and the same time period (either 10 five year or 50 one year periods), the death rate is related to the previously reported smoking habits. Apart from some directly standardised analyses at ages 70-89, this generally involves, as before,17 indirect standardisation (for age group and time period) to the “person years” distribution of the whole population being considered. From these indirectly standardised death rates, we calculated relative risks. Table 1 shows mortality by smoking habit for 11 major categories of cause of death, and for all causes combined. In these and all other analyses, current cigarette smokers are restricted to those who in all their previous replies (including the first, in 1951) reported smoking only cigarettes. Likewise, former cigarette smokers are restricted to those who, before stopping, had reported in all their previous replies smoking only cigarettes (or who had stopped before 1951, having last smoked only cigarettes). As previously,17 lung cancer and chronic obstructive lung disease are closely related to continued cigarette smoking and to the daily number of cigarettes smoked. For each of the other nine categories of cause of death there are more moderate, but again highly significant (each P < 0.0001), positive relations with the continuation of cigarette smoking and with the daily number smoked. How far, in this particular population, such relations between smoking and mortality reflect cause and effect has been discussed previously.17 23 Midway through the study, the results from the 1978 questionnaire confirmed the well known association between smoking and drinking,24 but showed little or no relation between smoking and either obesity or blood pressure (2), so these particular factors cannot help to account for the excess vascular mortality among smokers. The excess mortality from “external” causes—accidents, injury, and poisoning—among smokers is unlikely to be due chiefly to smoking (although two men did die from fire because of smoking in bed) but, rather, is likely to be due to other behavioural factors with which smoking is associated, such as the heavy consumption of alcohol or a willingness to take risks. Such external causes, however, account for less than 3% of the overall excess mortality among cigarette smokers. A quarter of the excess mortality among smokers is accounted for by lung cancer and chronic obstructive lung disease and another quarter by ischaemic heart disease; most of the rest involves other neoplastic, respiratory, or vascular diseases that could well be made more probable (among the survivors at a given age) by smoking. Some of the 11 relations in 1 have been increased by confounding, most notably with alcohol (which can increase the risk of developing cirrhosis of the liver and cancers of the mouth, pharynx, larynx, and oesophagus) and with personality (in the case of accidents, injury, and poisoning). Confounding, however, can act in two directions, as alcohol consumption—which is higher among smokers than among non-smokers (2)—can also decrease the risk of ischaemic heart disease and perhaps of some other conditions.24 Another important factor, not previously much emphasised, is the possibility of “reverse causality”—that is, some reduction in the apparent risk of death among current smokers because of a tendency for people to give up smoking after they begin to be affected by some life threatening condition (2), whether or not their illness was caused by smoking. When all 11 categories in 1 are added together, however, yielding overall mortality, the combined effects of all these non-causal factors—acting to increase or decrease the apparent hazards among smokers—are unlikely to have influenced greatly the absolute difference between the overall mortality rates of cigarette smokers and lifelong non-smokers. This difference, we conclude, provides a reasonably quantitative estimate of the extent to which, at particular ages, cigarette smoking caused death in this population. Cigarette smoking had become common among young men in Britain by the end of the first world war (1914-1918) and remained so for half a century,18 reinforced by the issue of low cost cigarettes to young military conscripts from 1939. As a result, men who were born in the first, second, and, particularly, the third decade of the 20th century and were still smoking cigarettes after the age of 60 had been smoking substantial numbers throughout adult life. This would not have been as much the case for men who were born in the last decades of the 19th century, even if they too were smoking cigarettes after the age of 60. The smoker versus non-smoker relative risks in 3 are, therefore, much more adverse for smokers born in the 20th century than for those born earlier, particularly for cigarette smokers. For the cohort born in the 19th century the cigarette smoker versus non-smoker relative risk when they were over 60 years of age was only 1.46 (excess mortality 46%), but for the cohort born in the 20th century it was 2.19 (excess mortality 119%). For heavy cigarette smokers (25 or more a day at their last reply) the smoker versus non-smoker relative risk was 1.83 for the cohort born in the 19th century and 2.61 for the cohort born in the 20th century, corresponding, respectively, to 83% and 161% excess mortality among the smokers. The patterns of survival from age 60 in these two birth cohorts among lifelong non-smokers and among those who smoked only cigarettes since 1951 are shown in 1, which gives the proportions of 60 year olds who would be expected to be still alive at ages 70, 80, 90, and 100. The substantial improvement among non-smokers is apparent, as is the lack of substantial improvement among smokers, corresponding to the increasing effects, from one century of birth to the next, of cigarette smoking on overall mortality. The comparisons in 3 and 1 involve only about a 20 year difference between the times when the mortality rates at a given age are being compared—for, although the median years of birth for all men in the two cohorts differed by 26 years, the median years of birth of those who died differed less. Subdivision of the younger participants by decade of birth (1900-1909, 1910-1919, or 1920-1929; only one was born in 1930) shows that, even among those born in the 20th century, the hazards associated with cigarette smoking differ substantially from one birth cohort to another (fig 2). For those born in the first decade of the century the difference between cigarette smokers and non-smokers in the probability of surviving from age 35 to age 70 was only 18% (58% ν76% (corresponding to a twofold death rate ratio)), but it was 28% (57% ν 85% (a threefold death rate ratio)) for those born in the third decade. This comparison again involves only a 20 year time difference. If we compare mortality at ages 70-89 during the five separate decades of the study (1951-2001) then the effects of a 40 year time difference (1950s ν1990s) can be studied, as the ages of the original respondents varied from only 21 to 100. Some 2000 men were already aged 70-89 at the start of the study, and some 4000 of the younger respondents eventually survived to reach their 70th birthday during the fifth decade of the study. Thus, in each study decade we can observe the death rates of men in their 70s and 80s and can calculate the probability that, at the age specific death rates prevailing in that particular decade, a 70 year old man would survive to age 90 (4). These reductions in mortality of the lifelong non-smokers were presumably due both to prevention of, and, particularly, to improvements in the treatment of, various diseases in elderly people. (For example, one of the present authors who is a participant in the study acquired a pacemaker 10 years ago.) But, among successive birth cohorts of cigarette smokers the increasing effects of cigarette smoking completely eliminated the great reductions in overall mortality at ages 70-89 that were occurring among non-smokers (4). Among those born in about the 1870s and observed at ages 70-89 during the 1950s, the cigarette smoker versus non-smoker death rate ratio was only 1.16 (92.9/80.1), whereas for those born in about the 1910s and observed at ages 70-89 during the 1990s the death rate ratio was 2.83 (113.1/39.9). For those born in 1900-1909, annual mortality among non-smokers was, both in middle and in old age, about half that among cigarette smokers. (These twofold death rate ratios are calculated from the logarithms of the probabilities of surviving from 35-70, 70-80, and 80-90 in 2 (top graph).) 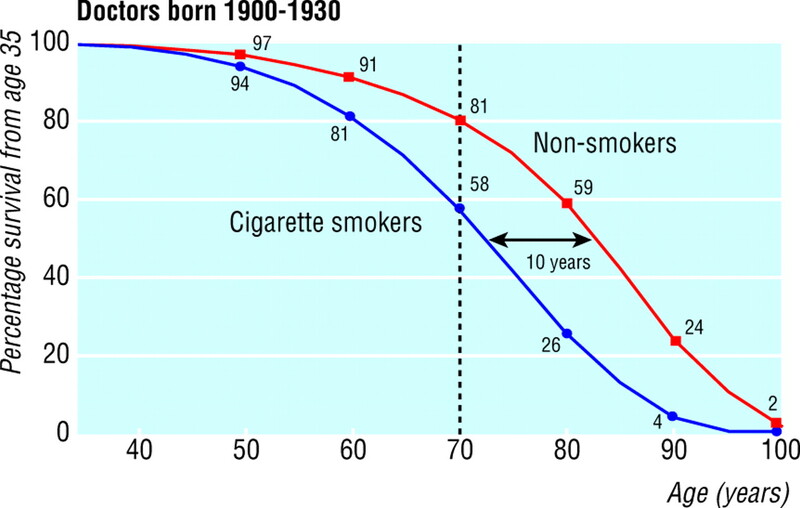 Taking, as before, the excess overall mortality among these smokers as an approximate measure of the excess mortality actually caused by smoking, this twofold ratio indicates that about half of the persistent cigarette smokers born in 1900-1909 would eventually be killed by their habit. For those born in 1920-1929 the probability of death in middle age (35-69) was 15% in non-smokers and 43% in cigarette smokers, corresponding to a threefold death rate ratio (calculated from the logarithms of the survival probabilities in 2 (bottom graph)). Extrapolation of the trends in 4 suggests that these men will also have about a threefold smoker versus non-smoker death rate ratio in old age (70-89). This indicates that about two thirds of the persistent cigarette smokers born in the 1920s would eventually be killed by their habit. 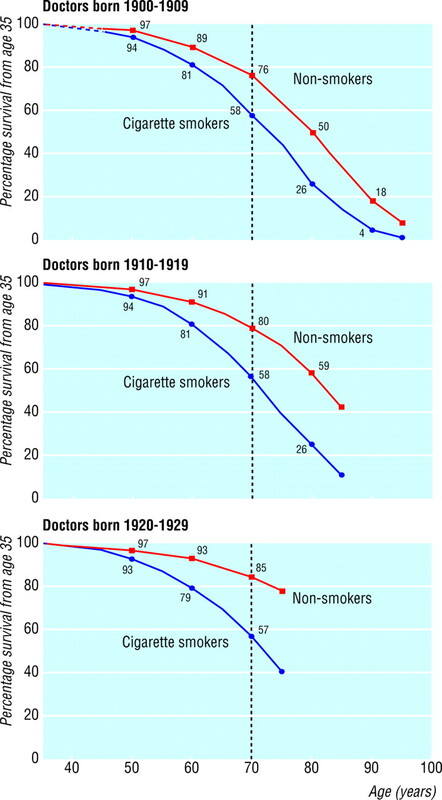 Figure 3 averages the findings in 2 for all men born in 1900-1930, distinguishing between lifelong non-smokers and continuing cigarette smokers. (Among the latter, the median age when they began smoking was 18, and at the start of the study their median age was 36 and their mean self reported cigarette consumption was 18 a day.) The results suggest a shift of about 10 years between the overall survival patterns of the continuing cigarette smokers and the lifelong non-smokers in this particular generation. That is not to say that all such smokers died about 10 years earlier than they would otherwise have done: some were not killed by their habit, but about half were, thereby losing on average more than 10 years of non-smoker life expectancy. Indeed, some of those killed by tobacco must have lost a few decades of life. A high proportion of the doctors who had been smoking in 1951 stopped during the first decades of this study, after it had become generally accepted by the British medical profession that cigarette smoking was a cause of most of the UK mortality from lung cancer.25 26 We can, therefore, examine mortality for some decades after stopping smoking (5). As the benefits of stopping cigarette smoking can be assessed directly only in a population where the hazards of continuing to smoke cigarettes are already substantial, our main analyses of cessation are again restricted to the men born in 1900-1930. Among them, those who stopped and those who continued smoking differed little in obesity and blood pressure and differed only moderately in mean alcohol consumption (2). But, although many stopped when still relatively young and healthy during the 1950s and ‘60s, some who stopped in later middle age did so because they were already ill (2). This removal of some imminent deaths of smokers from the current to the ex-smoker category reduces the apparent mortality among current smokers and may substantially inflate the apparent mortality of recent ex-smokers. For example, mortality at ages 55-64 among those who stopped smoking at ages 55-64 was spuriously somewhat greater than mortality among continuing smokers in that age group. Although the death rates for ex-smokers in 5 are given only for the age ranges after the range in which smoking stopped, they too may still be somewhat affected by such reverse causality (see above for definition). Nevertheless, 5 shows a steady trend in mortality at older ages (65-74 or 75-84) between lifelong non-smokers, ex-cigarette smokers who stopped at ages 35-44, 45-54, or 55-64, and continuing cigarette smokers. Thus, stopping earlier is associated with greater benefit. Mortality for ex-smokers is shown in 4, which (bearing in mind the possible relevance of reverse causality) indicates that even a 60 year old cigarette smoker could gain at least three years of life expectancy by stopping (fig 4 (bottom graph)). In 4, the mortality rates that would be seen at ages 60-64 among those who stop at about age 60 had to be interpolated (half way between the smoker and non-smoker rates), as they could not be assessed directly (partly because of reverse causality and partly because in this study there was often a delay of a few years before the next questionnaire arrived and cessation could be reported). This, however, makes little difference to the long term survival differences between continuing and ex-cigarette smokers. 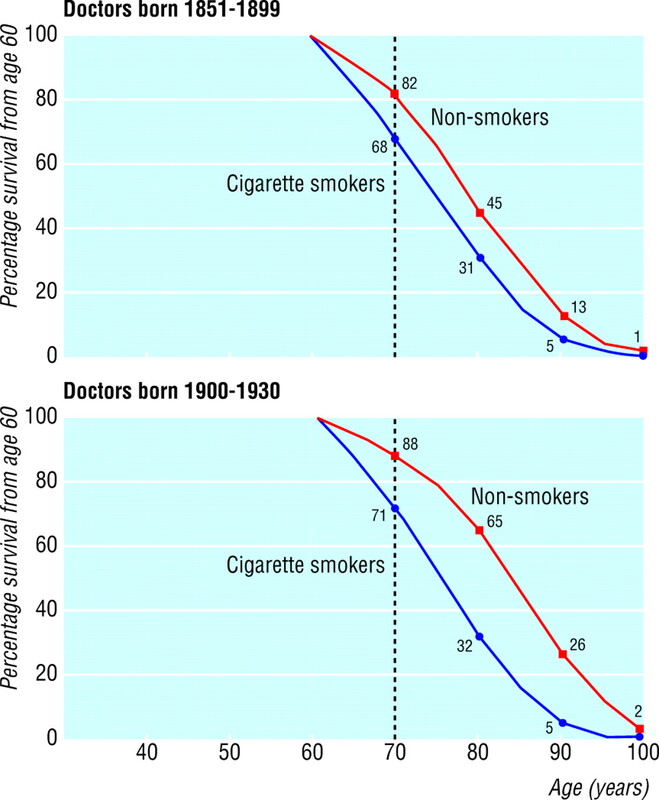 Those who stopped at about age 50 gained about six years of life expectancy; those who stopped at about age 40 gained about nine years; and those who stopped before middle age gained about 10 years and had a pattern of survival similar to that of men who had never smoked (fig 4 (top graph)). The mean cigarette consumption in 1951 (or when last smoked, if this was before 1951) was similar to that in continuing smokers for those who stopped at 45-64 and was only slightly lower for those who stopped at 25-34 or 35-44. Thus, the latter had, on average, had substantial exposure to cigarette smoking for about 20 years before giving up the habit, yet they still avoided most of the excess mortality that they would have suffered if they had continued to smoke. Table 6 describes the age specific mortality just from lung cancer among the same non-smokers, ex-smokers, and current cigarette smokers, comparing the observed numbers with the numbers that would have been expected if they had had the age specific lung cancer death rates of lifelong non-smokers. For statistical stability, these lung cancer death rates for non-smokers are taken from a much larger prospective study, which began in 1981 in the United States (see footnote to 6).19 At these US rates, 19.5 lung cancer deaths at ages 35-84 would have been expected among the lifelong non-smokers in the present study, and 18 were observed, which is a reasonably good match (mortality ratio 0.9). For the current cigarette smokers the corresponding mortality ratio was 15.9 (13.7 expected and 218 observed). There was a steady trend in this lung cancer mortality ratio between lifelong non-smokers, ex-smokers who had stopped at 25-34 (see 6 footnote), 35-44, 45-54, or 55-64, and continuing smokers. This trend confirms the findings from case-control studies27 that there is substantial protection even for those who stop at 55-64, and progressively greater protection for those who stop earlier. None the less, those who had smoked until about 40 years of age before they stopped had some excess risk of lung cancer at older ages. By combining the penultimate columns of tables 5 and 6, we calculated the annual lung cancer mortality rates per 1000 continuing cigarette smokers at ages 45-54 through to 75-84 to be 0.6 (that is, 8.5x33/487), 1.8, 6.2 and 8.7 respectively. At ages 45-64 these rates are somewhat lower than in the general UK population born around 1915, which includes a mixture of non-smokers, ex-smokers, and current smokers, and at ages 65-84 they are similar. Hence, the lung cancer death rates among male cigarette smokers must have been even greater in the general UK population than in this study. In many populations nowadays the consumption of substantial numbers of cigarettes begins in early adult life and then continues. But the full eventual effects of this on mortality in middle and old age can be studied directly only in a population, such as British males, in which cigarette consumption by young adults was already substantial when those who are now old were young. The generation of men born in Britain during the first few decades of the 20th century is probably the first major population in the world of which this is true. Daily cigarette consumption per UK adult (one, two, four, and six a day in 1905, 1915, 1933, and 1941 respectively—mostly consumed by men) was three times as great in the second world war (1939-45) as in the first world war (1914-18).28 Hence, men born in the 1920s may well have had even more intense early exposure than those born a decade or two earlier, as in the United Kingdom widespread military conscription of 18 year old men, which began again in 1939 and continued for decades, routinely involved provision of low cost cigarettes to the conscripts. This established in many 18 year olds a persistent habit of smoking substantial numbers of manufactured cigarettes, which could well cause the death of more than half of those who continued. Many, however, avoided the greater part of the risk by stopping smoking: although 70% of all UK males born around 1920 were smoking manufactured cigarettes in 1950 (at ages 25-34), only 29% were still doing so in 1985 (at ages 50-64).28 Hence, as UK males born in 1900-1930 reached extreme old age at the end of the 20th century—or, for those born in the 1920s, in the early years of the 21st century—they provide the first opportunity to assess directly the hazards of persistent cigarette smoking and, correspondingly (in comparison with those who continued), the long term benefits of cessation. The experience of the 24 000 men in this study who were born in 1900-1930 shows persistent cigarette smoking to be more hazardous than had appeared in previous analyses of this, or any other, study (figs 2 and 3), and shows correspondingly greater long term benefits from cessation (fig 4). Those who continued to smoke cigarettes lost, on average, about 10 years of life compared with non-smokers, while those who stopped at around age 60, 50, 40, or 30 gained, respectively, about 3, 6, 9, or 10 years of life expectancy compared with those who continued. Moreover, among those born in 1900-1930 the absolute difference between cigarette smokers and non-smokers in the probability of death in middle age increased from 18% (42% ν 24%, a twofold death rate ratio) for those born in the first decade of the century to 28% (43% ν 15%, a threefold death rate ratio) for those born in the 1920s (fig 2). In old age (4) the difference between cigarette smokers and non-smokers in the probability of a 70 year old surviving to 90 increased from only 2% (10% ν12%) at the death rates seen during the first decade of the study (among men born, on average, around 1875) to 26% (7% ν 33%) at the death rates seen during the fifth decade of the study (among men born, on average, around 1915), indicating that the corresponding difference will be still greater for those born in the 1920s. If so, then about two thirds of the persistent cigarette smokers among them would be killed by their habit. Both in middle and in old age, the increasing difference between the mortality of cigarette smokers and non-smokers arises because the large progressive decrease in the mortality of non-smokers in recent decades has, for the cigarette smokers, been wholly counterbalanced by the increasing death rate ratio of smokers versus non-smokers. Our 1994 report of the 40 year findings concluded that “Results from the first 20 years of this study, and of other studies at that time [the 1970s], substantially underestimated the hazards of long term use of tobacco.17 It now [in the 1990s] seems that about half of all regular cigarette smokers will eventually be killed by their habit.” Ten years later, the 50 year findings show that for the continuing cigarette smokers in this study who were born in the first, second, and third decades of the 20th century, the eventual risks vary from about one half to about two thirds (fig 2), although the mortality rates among them from lung cancer were, if anything, somewhat lower than among their contemporaries in the general UK population who smoked. It is a new finding that the risk of being killed by tobacco can be as great as two thirds, but this applies directly only to the hazards suffered by this particular group of professional British men during the past half century. If these results are to be used indirectly to help predict the risks that male, female, rich, poor, British, and non-British populations of persistent cigarette smokers are likely to face over the next half century, then it may be more appropriate to retain the previous semiquantitative conclusion that “smoking kills about one half.” For, although we have found a population in which persistent cigarette smoking killed somewhat more than half (fig 2), there may be other circumstances in which it kills somewhat less than half. Changes in cigarette manufacture might somewhat limit the eventual hazards, as might favourable changes in the prevention or treatment of neoplastic, respiratory or, particularly, vascular disease. But, unless such changes produce much bigger proportional reductions in mortality among smokers than among non-smokers, they will not make the age specific smoker versus non-smoker death rate ratios much less than 2, so the statement that about half are killed by their habit will not be an exaggeration. Moreover, the death rate ratios in 5 (which underlie 3) are actually somewhat greater than 2, and the tendency in some populations for intense cigarette smoking to be established before the median age of 18 that was seen in this study can only exacerbate the eventual risks. The general statement that in many very different populations the future risk of death from persistent cigarette smoking will still be about one half is therefore a reasonable one, and the results thus far in a widening range of studies in other developed19 20 and developing country populations such as China29–31 and India32 33 seem consistent with it (as long as the prolonged delay between cause and full effect is properly appreciated). If so, then on current worldwide smoking patterns (whereby about 30% of young adults become smokers) there will be about one billion tobacco deaths in this century, unless there is widespread cessation.34–36 For, with low tar cigarettes still involving substantial hazards,37 the quantitative conclusion from this study that seems most likely to be robust is that, even among middle aged smokers, cessation is effective and cessation at earlier ages is even more so. We thank chiefly the participating doctors, the BMA, and the Office for National Statistics. We also thank Cathy Harwood for typing the manuscript; and the Medical Research Council, the British Heart Foundation, and Cancer Research UK, which have funded this study for many years—most recently through their direct support of the University of Oxford Clinical Trial Service Unit and Epidemiological Studies Unit, the existence, computing facilities, and administration of which made continuation of the study possible. Contributors RD and A B Hill (deceased) designed the study in 1951; RP has worked on it since 1971, and all four authors have collaborated on the current update to 2001, the analyses, and the manuscript. RD will act as guarantor for the paper. Ethical approval No relevant ethics committees existed in 1951, when the study began.
. Tobacco: a medical history. J Urban Health 1999; 76: 289–313.
. Tabakmissbrauch und lungencarcinoma. Zeitschrift Krebsforsch 1939; 49: 57–85.
. Lungenkrebs und Tabakverbrauch. Zeitschrift Krebsforsch 1943; 54: 261–69.
. Onstaansvoorwasrden voor Longkanker. Ned Tijdschr Geneeskd 1948; 92: 3732–47.
. Smoking and carcinoma of the lung. BMJ 1950; 221(ii): 739–48.
. A study of aetiology of carcinoma of the lung. BMJ 1952; 225(ii): 1271–86.
. Tobacco smoking as a possible etiologic factor in bronchogenic carcinoma. JAMA 1950; 143: 329–36.
. Cancer and tobacco smoking. JAMA 1950; 143: 336–38.
. Tobacco smoking habits and cancer of the mouth and respiratory system. Cancer Res 1950; 10: 539–42.
. Tobacco smoking as an etiologic factor in disease: cancer. Cancer Res 1950; 10: 49–58.
. The mortality of doctors in relation to their smoking habits. A preliminary report. BMJ 1954; 228(i): 1451–55.
. Lung cancer and other causes of death in relation to smoking. A second report on the mortality of British doctors. BMJ 1956; 233(ii): 1071–6.
. Mortality in relation to smoking: ten years' observations of British doctors. BMJ 1964; 248(i):1399–1410, 1460–67.
. Mortality in relation to smoking: 20 years' observations on male British doctors. BMJ 1976; 273(ii): 1525–36.
. Cigarette smoking and bronchial carcinoma: dose and time relationships among regular smokers and lifelong non-smokers. J Epidem Comm Health 1978; 32: 303–13.
. Randomised trial of prophylactic daily aspirin in British male doctors. BMJ 1988; 296: 313–6.
. Mortality in relation to smoking: 40 years' observations on male British doctors. BMJ 1994; 309: 901–11.
. The causes of cancer: quantitative estimates of avoidable risks of cancer in the United States today. J Natl Cancer Inst 1981; 66: 1193–308. (Republished by Oxford University Press as a monograph in 1983).
. Mortality from tobacco in developed countries: indirect estimation from national vital statistics. Lancet 1992; 339: 1268–78.
. Tobacco and Cancer: Recent Epidemiological Evidence. J Natl Cancer Inst 2004; 96: 99–106.
. Alcohol consumption and mortality among middle-aged and elderly US adults. N Engl J Med 1997; 337: 1705–14.
. Tobacco smoking and cancer of the lung. BMJ 1957; 234(i):1523.
. Smoking and health. London: Pitman Medical Publishing, 1962.
. Smoking, smoking cessation, and lung cancer in the UK since 1950: combination of national statistics with two case-control studies. BMJ 2000; 321: 323–9.
. International smoking statistics. Oxford: Oxford University Press, 1993.
. Emerging tobacco hazards in China: 1. Retrospective proportional mortality study of one million deaths. BMJ 1998; 317: 1411–22.
. Tobacco—the growing epidemic. Nat Med 1999; 5: 15–7.
. Mortality and smoking in Hong Kong: a case-controlled study of all adult deaths in 1998. BMJ 2001; 323: 1–6.
. Cohort study of all-cause mortality among tobacco users in Mumbai, India. Bull World Health Organ 2000; 78: 877–83.
. Smoking and mortality from tuberculosis and other diseases in India: retrospective study of 43,000 adult male deaths and 35,000 controls. Lancet 2003; 362: 507–15.
. Future worldwide health effects of current smoking patterns. In: Koop CE, Pearson CE, Schwarz MR eds. Critical issues in global health. San Francisco: Wiley (Jossey-Bass), 2001: 154–61. eds. Tobacco or health: a global status report. Geneva: World Health Organization, 1997.
. General remarks: future worldwide health effects of current smoking patterns. In: IARC monographs on the evaluation of carcinogenic risks to humans. Vol 83. Tobacco smoke and involuntary smoking. Lyons: IARC, 2004: 33–47.
. Cigarette tar yields in relation to mortality from lung cancer in the cancer prevention study II prospective cohort, 1982–8. BMJ 2004; 328: 72–6.